REPUBLIC, Mo. 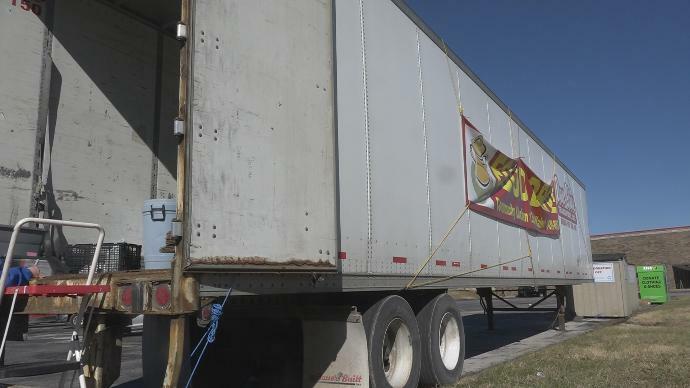 – The fifth annual Fill-A-Trailer Food Drive kicked off Saturday. This drive supports the Community Kitchen in Republic, Mo. “We serve three meals a week to anyone in need,” Cheri Hamilton, board member with the Community Kitchen, said. The kitchen feeds people in the community every Tuesday, Thursday and Saturday. In the last six years, Hamilton says they have fed more than 30,000 meals. They host a community wide food drive each year beginning the Saturday afternoon Thanksgiving. They collect can goods, boxed items and monetary donations. Rian Baker, 10, spent Saturday morning volunteering. “And I want to start helping people in need,” Baker said. Baker organized food items all morning. She says she was happy to help. “I feel good that I am playing a part in this,” Baker said. Donations can be dropped off at Orscheln Farm and Home in Republic every Saturday from 10 a.m. to 3 p.m. through Dec. 15. You can also drop off items in the gold bins outside of the store anytime. For information about volunteering with the Community Kitchen, click here.